I will start off by saying that yes, calling toast "crunchy" is rather redundant, but the word "toast" on it's own seems rather sad and lonely. Moving on. Later in the evening he made us some toast with peanut butter and jam. It's obviously a simple and mega popular meal/snack but I hadn't made it myself in ages, and it reinvigorated some kind of PB&J-based urge inside me. So here we are. 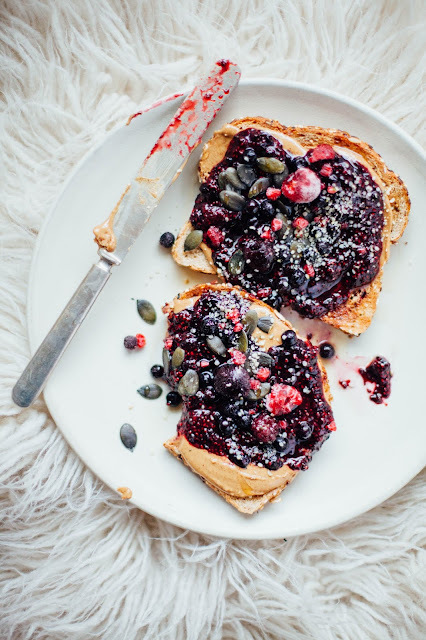 The jam is about as basic as you can get: it's just berries mashed up and mixed with chia seeds. The chia seeds make the texture like jam. It's awesome, very good for you and takes like 10 minutes to whip up. I do recommend eating the jam ASAP though, it's too fresh to keep in the fridge in large amounts for a week. Expectedly, PB&J is a classic fave for a reason: it's freaking delicious. The textures of crunchy, carby toast with creamy, salty, fatty peanut butter and finally sweet, gooey jam... WHAT'S NOT TO WORSHIP!? I topped mine off with more seeds and berries because it looks pretty, and drizzled on some maple syrup because "Add maple syrup." is my one consistent life rule. To make the jam: thaw the berries if frozen (I just threw mine in a microwave for a minute). Mash the berries into a chunky paste. Stir in the chia seeds and let the seeds and berries sit together for 15 minutes or so: the chia seeds will thicken up the mixture into delicious, fresh jam. Add some sweetener if you want. Assembly: spread the peanut butter on your toast, followed by the jam. Then garnish with your toppings and enjoy!